At Tom Wood Volkswagen, we are committed to providing Indiana drivers with a stress-free dealership experience. Shopping for a new or used VW car, wagon or SUV should be enjoyable. That's why we work with complete transparency, taking the hassle out of buying or leasing a car. When you shop at our VW dealership, you are treated with the respect that you deserve. Our incredible team of VW sales associates, finance professionals and expert service technicians are here for you, every step of the way, because the dealership experience begins with the sale, but extends for the life of your vehicle. Come to our Volkswagen dealership in Indianapolis, IN, and drive home satisfied. We hope to see you soon! When you arrive at our Indiana Volkswagen dealership, know that you're working with a fantastic group of individuals. Recently, Tom Wood Volkswagen was recognized for excellence with the Diamond Pin Award -- the most prestigious award that Volkswagen can bestow on a dealership. Only five dealers in the United States and twenty dealers worldwide can receive this award, and it is a true mark of our dealership's dedication to exceeding expectations. Plus, we have been regionally recognized for excellence by earning the Indy Star Award and have been the No. 1 Indiana Dealer for 18 years; these recognitions and awards further mark our record of satisfying customers day after day and year after year. 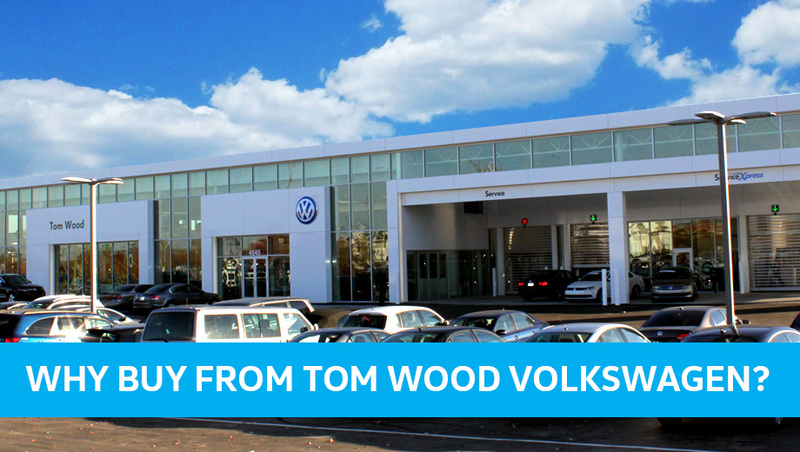 So be sure to head to Tom Wood Volkswagen to enjoy a top-of-the-line car-buying experience! Need Another Reason to Visit Tom Wood Volkswagen? Our Volkswagen Tire Store offers a price-match guarantee. Our Volkswagen Service Credit Card offers exclusive benefits to card holders. You have access to the nearby Tom Wood Collision Center in Indianapolis, with Saturday hours for your convenience. We offer express service for routine maintenance, and our VW service center is open on Saturdays. Our late-night drop-off hours make it easy to bring your car in for service. You can take advantage of our large fleet of loaner vehicles. For your convenience, we offer shuttle service when visiting our service center. When you purchase a vehicle from us, you get free car washes for life at our dealership. Our waiting area provides complimentary Wi-Fi and coffee for you while your vehicle is being serviced. We also provide a children's play area to occupy the little ones while you wait for your vehicle when you visit our VW service center.